There are a lot of people who complain about rainy days, but we don’t mind them at all. There’s nothing quite like cuddling up on the couch with an oversized blanket on a dreary day. 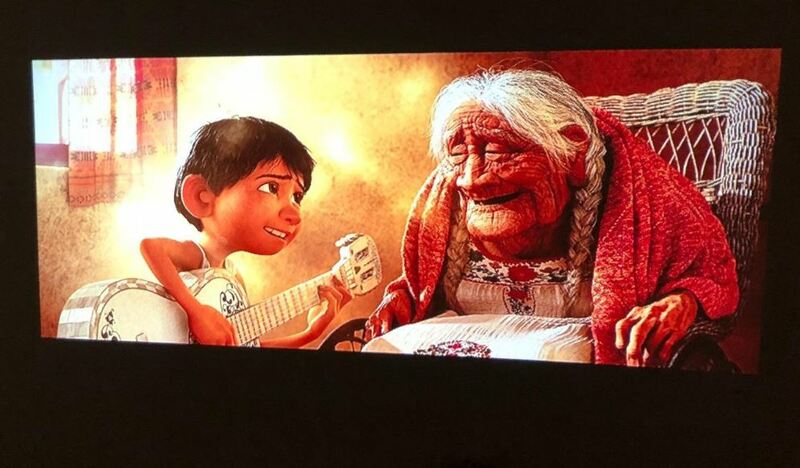 And what goes better with couch cuddling than film watching? Take a healthy dash of coziness and smash it together with your favorite childhood movie and you’ve got yourself an amazing afternoon. Let’s talk about projectors. Not just any projectors, but mini-projectors. This isn’t your grandpappy’s media device. This is a personal movie theater in your pocket. Projectors have their drawbacks; we’re not bold enough to refute that, but as far as immersion and screen size are concerned, there is no comparison. Projectors work much better in rooms with low-lighting, and they take a little more effort to install, but a 100” screen size is completely worth the very few downfalls. 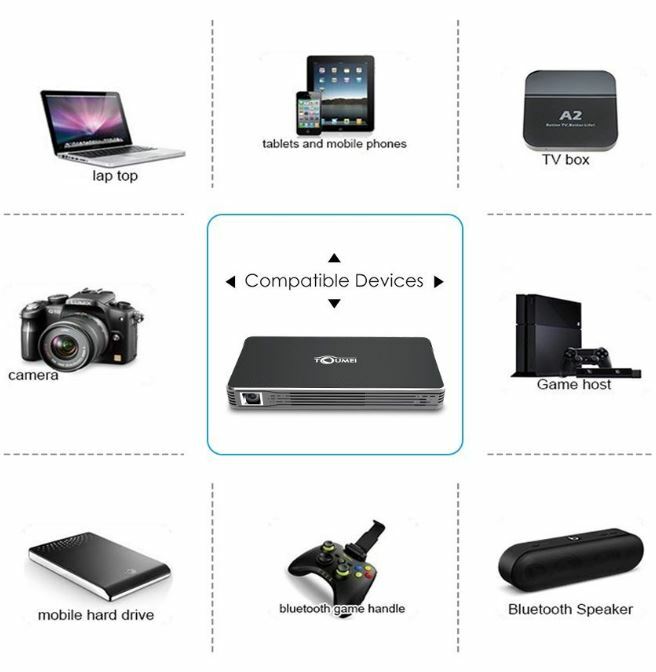 The TouMei C800 portable mini-projector combines portability, smart mobile technology and performance. 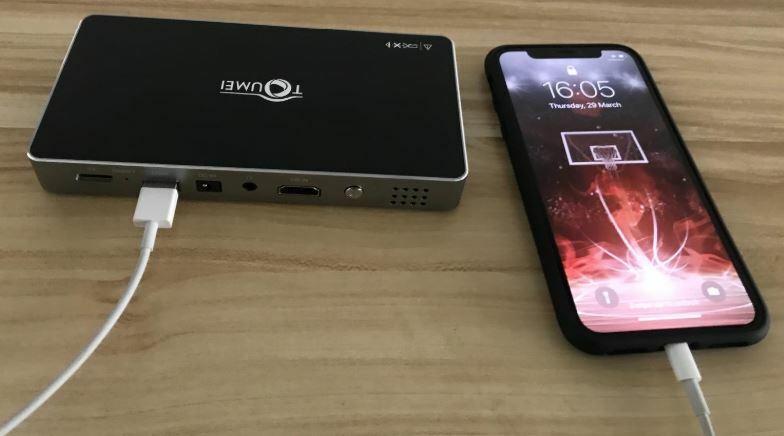 Marketed as one of the smallest projectors on the market, this is a gadget that can literally fit in your pocket. Mini-projectors have come a long way in the last few years, particularly as far as resolution is concerned. Once upon a time, the list of home projector options was pretty thin. If you wanted a projector that wasn’t a complete eye sore, you’d have to shell out an immense amount of money. The miniaturization of HD tech has led to a major influx in the projector market. Over the past week, we tested out the TouMei C800 for ourselves. After putting the projector through the wringer, we believe we have a good grasp on the specs and features of the device. Here is our honest review of the TouMei C800 mini-projector. The C800 ships in an attractive, high-quality black packaging. While it might not seem like a big deal, we have found that some projector companies ship their product in chintzy cardboard boxes. The premium packaging is a nice touch. 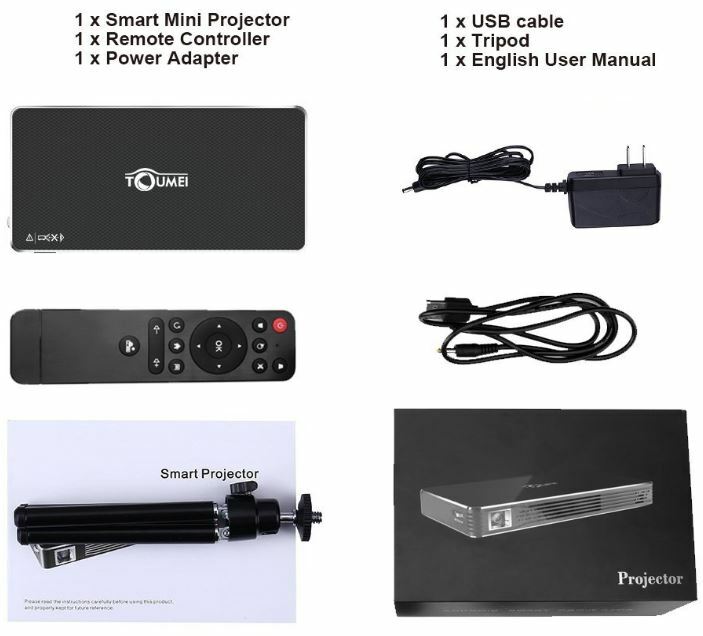 Included in the box is the projector itself, the power supply, the remote control, a user manual and a tripod for easy, manual installation. The tripod is great for people who aren’t planning on mounting the projector to the ceiling, but still want a stable, elevated surface. The remote control is pretty standard as far as a projector remote goes. The design sort of reminds us of the Roku remote controls. Very simple and clean, but totally effective. One of the most attractive features of the C800 is its incredibly small stature. The projector measures in at 7.4 in. x 5.1 in. x 2.5 in. and weighs 9.3 ounces, which makes the device not much larger than the iPhone 7 Plus. We mentioned earlier that the C800 can fit in your pocket. That was not just a matter of hyperbole. The device’s small stature makes it very inconspicuous and ridiculously portable. Even when we had no more room in our backpacks, the projector fit snugly into our back pockets. The TouMei’s small size also makes it very easy to conceal, meaning no unsightly additions to your interior design, if you’re into that type of thing. For us, the projector fit in perfectly amongst our Star Wars posters and Marvel action figures. Unlike some low- to mid-priced mini-projectors, the C800 offers support for 1080p HD resolution. When you’re dealing with such a tiny device, it’s hard to squeeze a whole lot of performance out of the such little space. TouMei has managed to sneak in enough hardware to generate a gorgeous HD projection. Perhaps even more impressively, the C800 can display a HD picture with a screen size up to 120”. If you’ve never used a home projector, there is no way to describe the experience without sounding like we’re exaggerating. A 120” display in your living room is a revelation. Since you can sit so close to the screen, sometimes it feels more immersive than a movie theater. It’s truly an awesome experience. To our eyes, the resolution looked gorgeous, not just for a mini-projector, but any projector. Despite the C800’s native 854 x 480 pixel resolution, the HD upscaling looks remarkably close to actual 1080p quality. The 1080p looked great, even when the projector was further away from the screen surface. The color reproduction was above average and the contrast looked great for the price. One of the best part of buying a projector is their versatility. We found that the C800 screen looked best between 30” and 120”. With such a huge screen size range, we don’t see any reason why you should have an issue finding your own personal sweet spot. The wide range also adds to the projector’s portability. The C800 can adapt to a large variety of size restraints, which means that even if your friend doesn’t have as much wall space as you, you’ll still be able to use the projector. We’d like to point out that it’s possible to stretch the screen larger than 120”, though the quality starts to degrade after this point. The TouMei C800 uses the latest OSRAM LED DLP 100 Lumens lamp, which shines 30% brighter and uses 70% less energy than previous generations. One of the concerns of projector owners is the effect that the lamp will have on their power bill. While we didn’t use the C800 long enough to draw a conclusive energy analysis, we have used projectors with OSRAM LED lamps before and never noticed a significant jump in electricity consumption. What we did notice, though, was the brighter illumination. The extra bit of illumination allows for better performance for rooms which are not completely insulated from light. Naturally, the projector looks best in darker conditions, but we noticed a definite improvement with the brighter LEDs. The LED lamp has a lifespan of about 30,000 hours (give or take 15 seconds), which means you’ll be able to get your money’s worth out. That means you could leave the projector on 24 hours a day for 3.5 years, without having to replace the lamp. 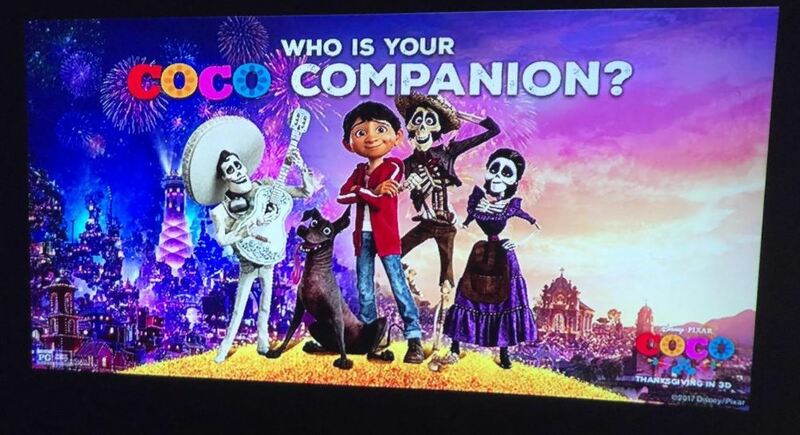 Side note: If you’re watching movies 24 hours per day, please seek help. But seriously, keeping the projector churning for more than 3-4 hours at a time probably isn’t a great idea if you’d like to maintain optimal performance. We suggest taking a break every few hours, both to reduce eye strain and to give the lamp a break. 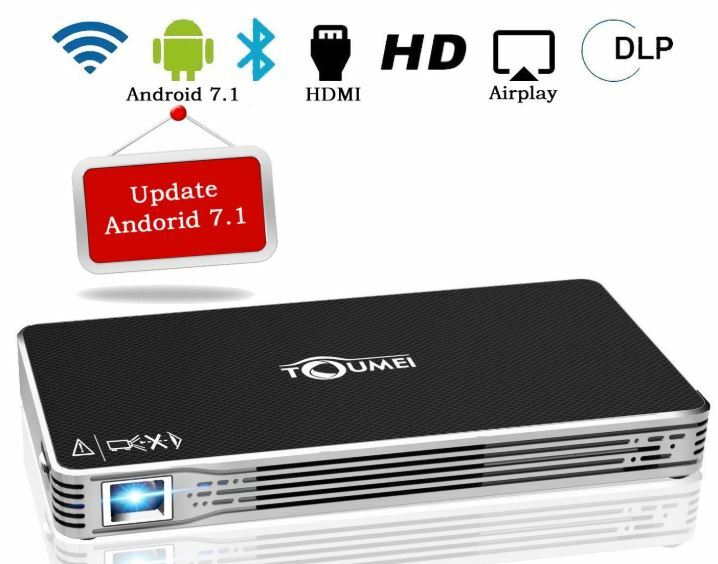 The TouMei C800 projector features Bluetooth 4.0 compatibility, which means if you have the right gear, the device is capable of operating with true wireless connectivity. The C800 works well with Bluetooth speakers. The ability to use wireless speakers allows you to vastly improve the sound quality without having to run unsightly cables through your home. The C800 also features seamless integration with smartphones, particularly Android (since the device itself runs on Android). 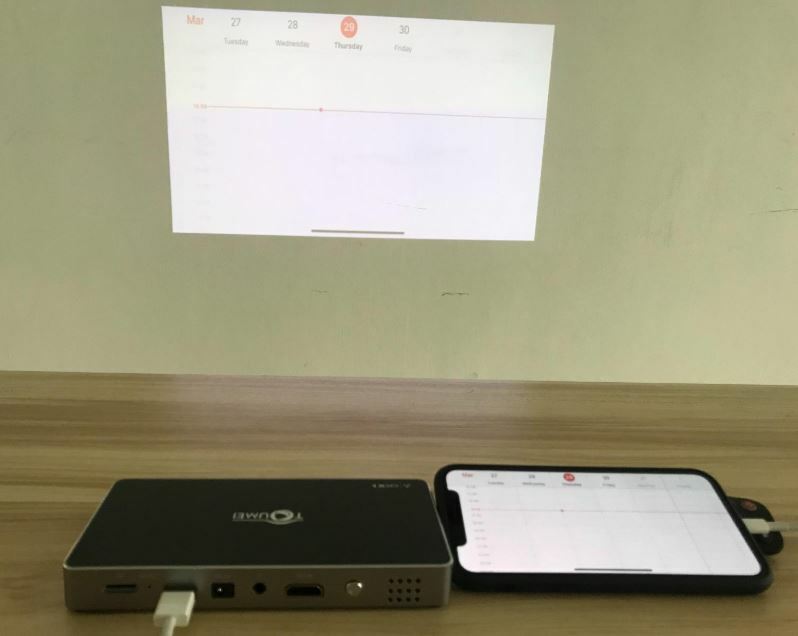 Connecting your iOS device requires opening the HappyCast app which is included with the projector, and using AirPlay to mirror the iPhone screen to the device. The C800 is compatible with Android Multiscreen, also through the HappyCast app. Simply connect your device to the same WiFi connection (compatible with both 2.4 Ghz and 5 Ghz bands) as your projector and the software does the rest. Being able to display your mobile device through the projector is a much-desired, yet rarely found feature in affordable projectors. Such efficient Bluetooth technology on such a miniaturized device is a very welcomed feature. TouMei has done us all a favor by including some impressive hardware in the mini-projector. It features a Quad-Core ARM Cortex A7 processor, which provides a clock speed of up to 1.2 Ghz. The processor is supported by 8GB of memory and 1 GB DDR3. As a result, the projector’s overall speed feels snappy and tight. We noticed no noticeable lag or hardware performance issues. The OS operated without a stutter. We’ve been underwhelmed by the hardware speed of projectors in the same price range before, but the C800 is thankfully not one of those disappointments. If you’d rather hardwire your external devices, the C800 also features input ports for HDMI, USB, SD cards and wired headphones. While we definitely recommend taking advantage of the projector’s Bluetooth capability, the option for hardwiring is there. The USB port is a nice touch, allowing you to connect an external hard drive, USB drive or even (nothing was stirring, not even) a mouse. The C800 features a 4200 mAh lithium battery, turning your projector into a truly wireless device. A full-charge gave us enough juice to play an entire three-hour film. While the battery can last an entire movie, we wouldn’t recommend trying to binge watch without a power source nearby or you might find yourself with a dead projector. And when we say movie, we mean an average length film – no Lord of the Rings or Gone with The Wind. At least not without the power supply. 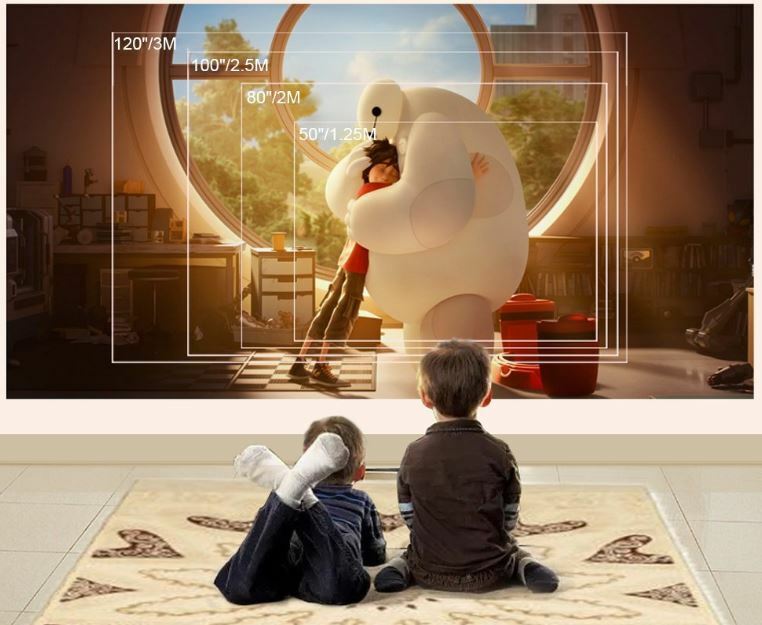 Unlike televisions, projectors have the potential to go out of focus. If you’re already comfortably sitting in your favorite chair, the last thing you want to do is get back up to adjust the projector lens. Thankfully, the C800 features automatic focusing with 45 degrees of keystone correction. During our review period the auto-focusing feature worked like an absolute charm. Even when the projector was jostled around a bit, the 45 degrees of auto correction did their job admirably. If you’d like to limit the amount of focus correction, make sure to keep the projector on a stable surface. Using the included projector helps. The TouMei C800 smart mini-projector was a breeze of fresh lilacs amidst a garbage dump of low-priced home projector equipment. The device’s tiny size and wireless Bluetooth compatibility make the C800 one of the most attractive projectors on the market. If you’re looking for an inconspicuous home theater projector that is extremely portable and capable of projecting your mobile devices in 120” of glory, then the C800 is just the ticket.